A last minute Christmas gift arrived in the mail today. 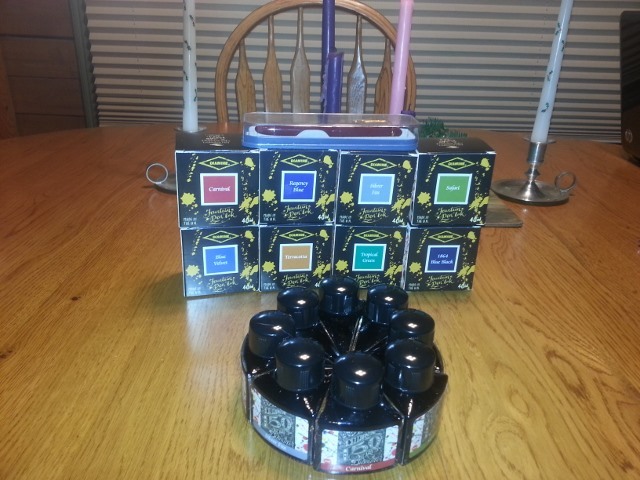 It was from our daughter, a budding fountain pen aficionado. 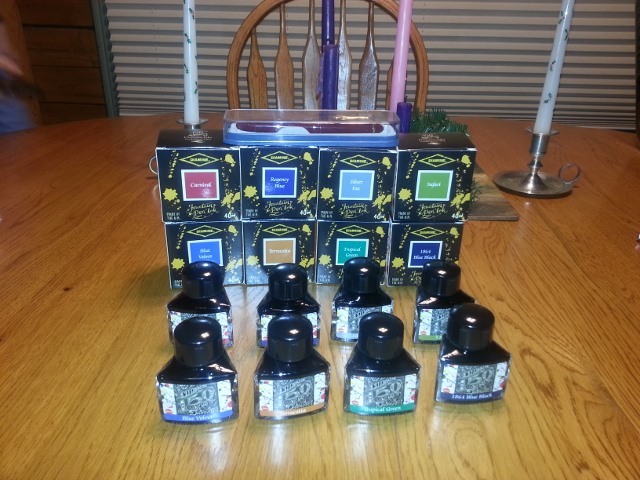 It is the Diamine 150th Anniversary set. Eight 40 mL bottles. The bottles are triangular in shape and form a circle. We had our eyes on these but they sold out from Goulet before we could place an order. My daughter got them on ebay from a Portuguese seller - hence the slight delay. He shipped immediately. A good seller. I was eyeing those, Phil. Let us know how they perform and what you think of the colors. The blues in that set are quite good! I like Blue Velvet most followed by the Blue Black then Regency. Haven't tried the other colors in the set though. It's a challenge for collectors such as myself to hear the boxes were burned. However, i'm also envious of your great intention to actually use them for their true purpose. Obviously, Jack, that is a personal decision. While I don't have Merlot, I do have another of Diamine's wine colors, Syrah, and it is beautiful. Two of my preferred Diamine colors are Oxblood and Denim. The Denim really does remind me of Levi's 501 Shrink to Fit jeans and the Oxblood name suits the color. Obviously, the colors I mention are ones that please me. Go with the color you are drawn to strongest. If you like two equally, and your budget can handle it, then go for both of them. I have tried the Merlot and Turquoise as well as all the ones Freddy recommended and like them all . 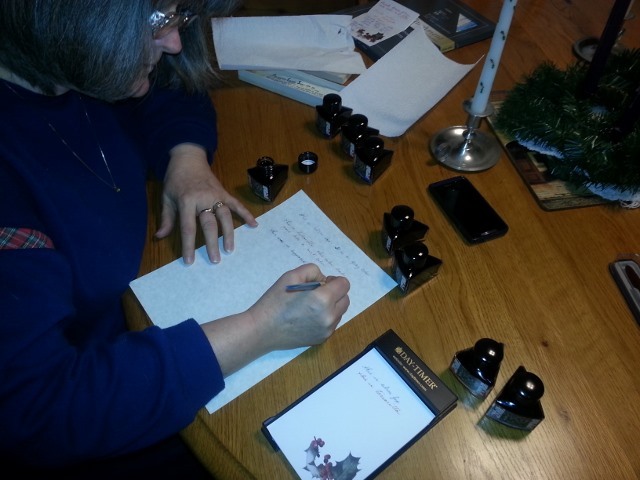 Mary Lou used a dip pen to try the eight inks. It is hard to get a feel with a dip pen but ML said they wrote fine. They were more muted than I expected. I liked the tropical green, carnival red and terracotta. ML was partial to the three blues. I really wanted to like the silver fox but it was a little to dull for my taste. (12-30-2014, 06:49 AM)MaxP Wrote: It's a challenge for collectors such as myself to hear the boxes were burned. That made me smile. 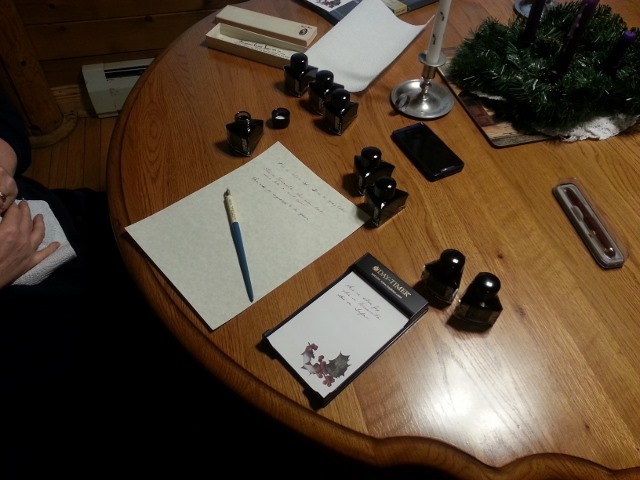 Fountain pens and accessories, like my shave gear, are for use and enjoyment. Apologies for getting OT, but have you any lens cans in your 'metal' collection? They're quite captivating. My collection is mostlynof modern tins for food items. Cookis, teas, etc. 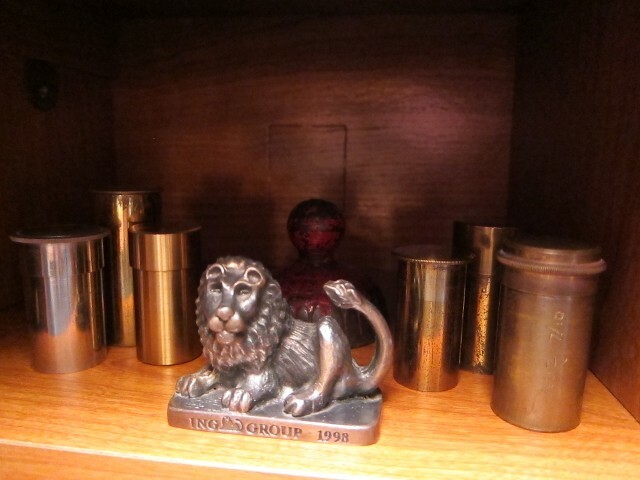 I have a handful of antique tins from my wife's father's pipe smoking days. My mom is a Brit and they used tins long after the US switched to cardboard so I have a few of those from the 60s. But no lens cases. I will look next time we go antiquing. Those colours look great, Phil and congrats on the gift!